Heat oven to 350°F. Spray bottom of 15x10x1-inch pan with cooking spray. In large bowl, make cake batter as directed on box. Pour into pan. Bake 20 to 25 minutes or until toothpick inserted in center comes out clean. Cool completely, about 1 hour. In medium bowl, mix vanilla frosting and peanut butter until mixed well. Drop frosting by spoonfuls evenly over cooled cake; carefully spread, and top with Toppings. To serve, cut into 6 rows by 4 rows. The unwrapped minis are perfect for topping the cake, but if you can’t find them, the wrapped miniature peanut butter cups will also work. Just be sure to cut them in half before topping. 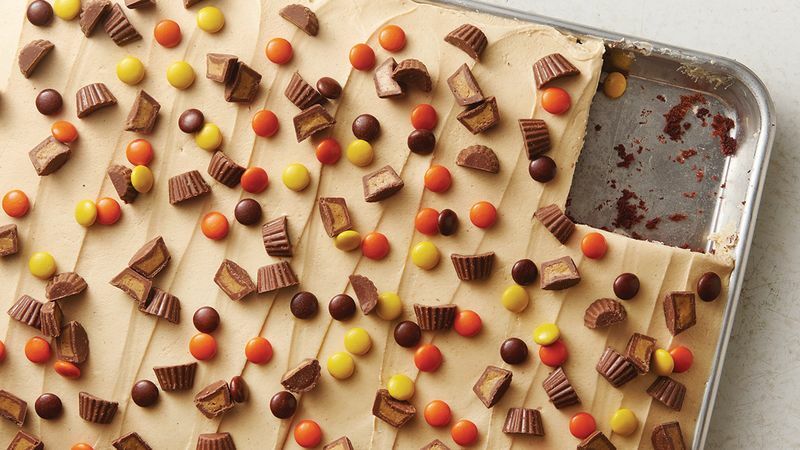 Reese’s™ peanut butter sheet cake (a.k.a reese’s cake) is full of surprises. The combination of crunchy candy pieces and fluffy devil’s food chocolate cake creates a texture that is nothing short of delightful. Plus, who knew you could make peanut butter frosting by simply adding peanut butter to vanilla icing? Keep that tidbit of information handy for your next cake.